Bonus: My always helpful readers have informed me that I flipped at least two out three of yesterday’s pictures. The Rice History Corner regrets but is not particularly surprised by the error. Let’s try again, shall we? 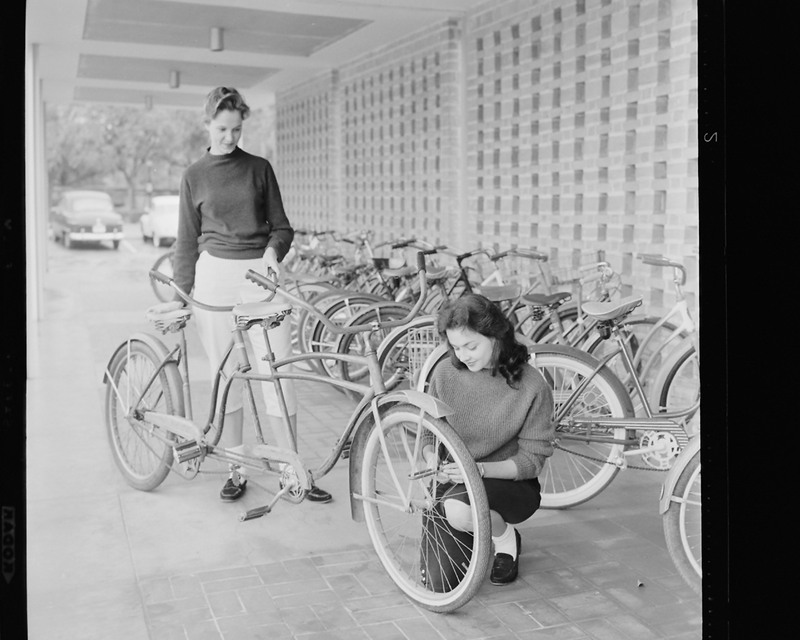 I believe she is putting a long-shackle combination lock through the front wheel spokes and fender stays. Could the two guys in the top photo be wishing wistfully that they lived in the old section of Hanszen? I cannot come up with their names at this moment but I bet it is Wiess somewhere around ’83-85. Maybe they just came out of the fifth hour exam in Chem 120 in ’56-’57, for which the mean test score was 15 (out of 100). My score – 0. I did manage to pass the course. 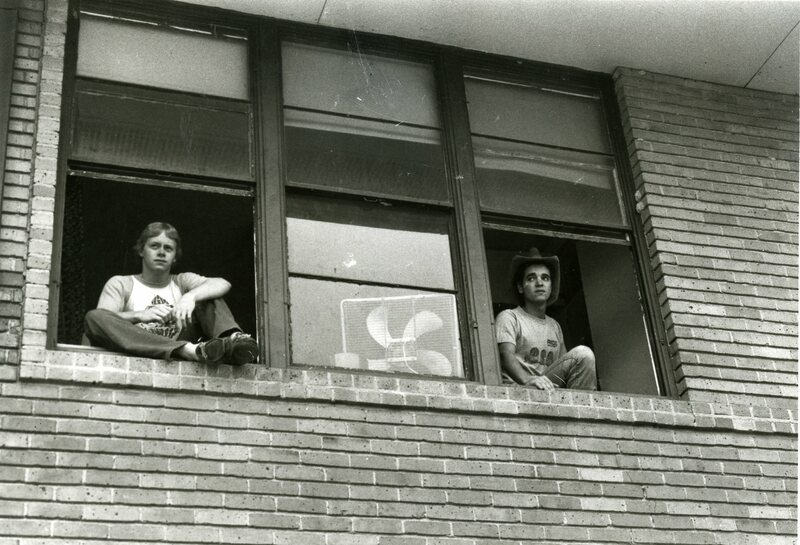 The two gentlemen in the windows are Ross Rhone ’85 and Eric Hotung ’84. 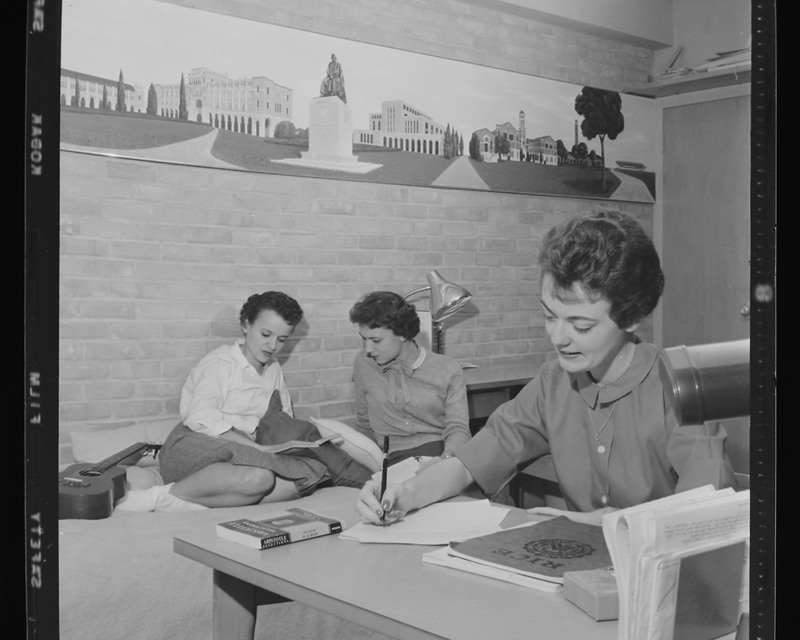 It’s a photograph from the 1983 Campanile (p. 335). They are sitting in the windows at the end of the second floor of the tennis court wing of old Wiess College (maybe room 201?). That was 36 years ago so I wanted to confirm their names before putting them out there. Thanks for doing the leg work for me, Gary! Home-made tandem, welding two single frames together. The book appears to be “Aristotle Selections” edited by W.D. Ross (no relation) … first published in 1955.